We present you a compilation of 18 sets of free vector icons that can be used in plenty of web designs, UI designs, web projects, etc. All these sets are differently themed, so hopefully you will find just the right theme for your particular project. The compilation includes flat free web icons, watercolor style icons, Christmas inspired icons, transparent, edgy and even more styles. All these collections are absolutely free to download, so go ahead and test them out on your projects. Also, they come in vector format which makes them incredibly easy to customize according to your taste. Let’s get started! Simple and stylish collection of free vector icons that look elegant and glossy. Designed in silver and pink, this set is absolutely free to download and customize. What a lovely way to spread the Christmas spirit through your website’s design! This collection of social media icons presented as ornaments is the perfect way to do it. A collection of free web icons designed in a vector format and presented in lovely heart shape. Perfect for St. Valentine’s day, love and wedding related websites, blogs, etc. A set of free vector icons on designed in fun and edgy style, representing jeans with seam. This collection comes in vector format, so feel free to modify it to your taste. A collection of free web icons presented as watercolor stains. Designed in many colors, these icons are easily customizable since they come in a vector format. A free-to-use collection of round watercolor social media buttons in eye-pleasing colors. These icons come in a vector format so they are very easy to customize. 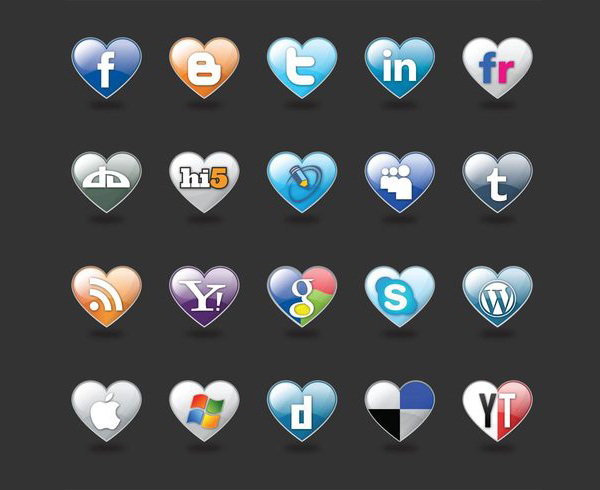 Stylish and glossy looking set of round social media icons designed with a transparent border. These icons can give any web design a modern look and they come for free! A collection of colorful free vector icons designed as pins. This set of icons can be downloaded for free. Since they come as vectors, feel free to play with colors and shapes. A collection of flat web icons designed in minimalistic outline style. This design is available for free and is appropriate for plenty of websites since it comes in clean, unobtrusive style. A rich collection of flat free vector icons including all kinds of icons designed on colorful square backgrounds with rounded edges. This set comes for free, so go ahead and get it. An attention-grabbing collection of social media icons designed in unique style. These icons can absolutely impress your audience and they come for free, so give them a shot. A collection of website icons available for free download and designed in interesting style: cardboard background and glossy surface. Go ahead and try them out! An artistic collection of squarish icons that look like they are hand painted. This set can be used in plenty of projects and comes for free, so feel free to experiment. A set that will bring the Christmas spirit right into your web design. These famous social media icons are adorably decorated with Christmas wreaths. Ho ho ho! A collection of round shaped icons, designed as stickers with peeling edges. These icons are illustrated in modern flat style and they can be used in your designs for free. Stylish semi-transparent social media icons that come in vector format which makes them easy to modify. These elegant icons can fit into a wide range of web designs. A collection of square social media icons designed in distressed style. These colorful icons come for free and can me modified according to your taste, so get them all. A set of free vector icons designed as brush strokes. These icons can be used in a broad diversity of web projects. They can also be modified to look just the way you need them. We hope you’ve found just the right set of free vector icons for your project. If you loved our compilation, stay tuned. More are coming soon.